Every week at Bar-Ilan University hundreds convene for weekly Torah lessons by Rabbi Haggai Lundin in cooperation with Kollel Organization. 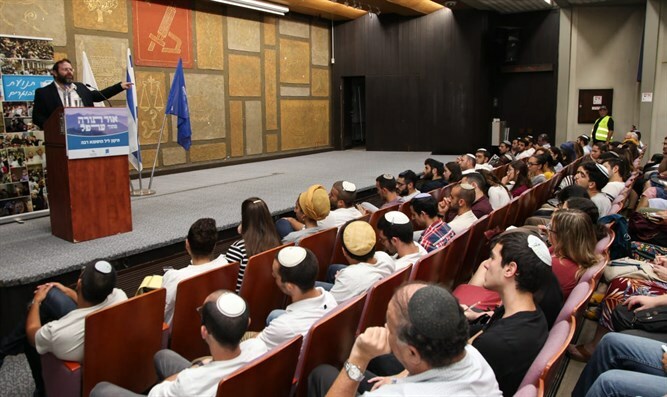 Every week, hundreds of people gather at the Bar-Ilan University Beit Midrash to hear the Heart of the Parsha lesson by Rabbi Haggai Lundin, who deals with the weekly Torah portion. The lesson is a joint initiative of the Community Organization, the Higher Institute for Torah Studies, and the Campus Rabbi's Office at Bar-Ilan University. The classes are taught at the University Beit Midrash on Mondays at 20:30 by Rabbi Haggai Lundin and also broadcast on Moreshet Radio. "We hope a class in such a central place in Israel will be able to further expand the learning audience," said Rabbi Lundin.